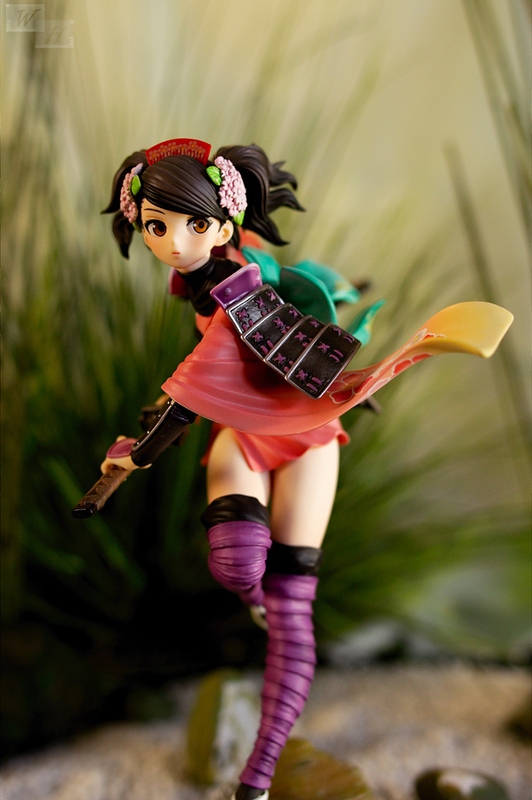 Momohime is a quite popular figure from ALTER which was released in 2010, she was re released in January 2013. I already wrote a review of her. With the upcoming re release I had a vague idea about a reshooting of this figure to use them or a new blog post, but somehow I couldn’t build up the motivation to do so. Only after an inspireing post from Miette-chan I could gather the motivation for creating an idea forthe settting and making the pictures. 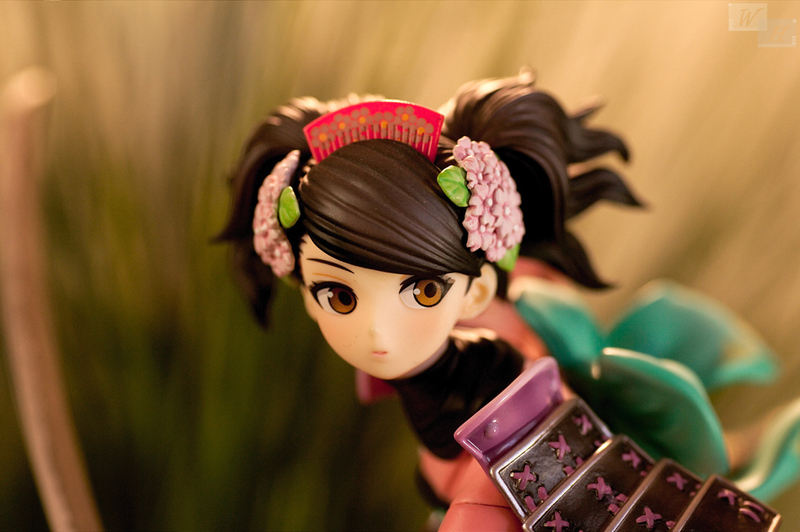 Im a passionate figure collector who not only puts the figures on the shelf, I also like taking pictures of them. I always think about a fitting setting for the pictures to put them in the figure reviews afterwards. Sometimes I also get so so results, that are barely acceptable for me. Especially when looking back at older pictures I sometimes feel a bit dissapointed with some works, be it bad lighting, crappy white balance or a setting looks not as appealing as expected. Well, everybody started at a certain point and due to improvement trough practical training, it can’t be helped to be slightly dissapointed when looking at earlier pictures. Even nowadays I won’t always created the results I wanted to get. Sometimes I feel the urge to think about better ideas of a setting for a certain figure, finding ideas can be pretty easy or give you a headache. Between preparing reviews with pictures and text, finding time to take pictures of past figues often comes a bit short, but with the right idea in mind, it can be a rewarding time investment. At best looking back at a figure and taking her for a new shooting can bring you the joy of trying something new and getting better results compared to the ealier ones. It is a lot of fun. 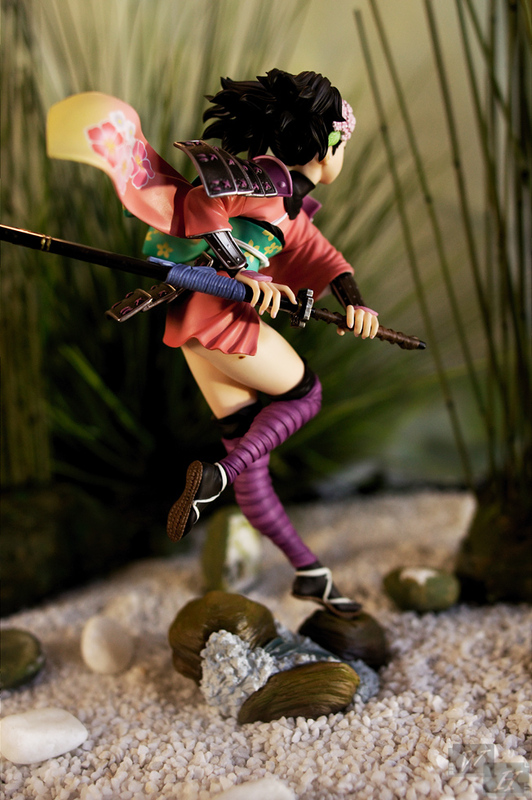 Momohime was sculpted by Fukumoto Noritaka, the figure is nicely detailed and has many interesting aspects. 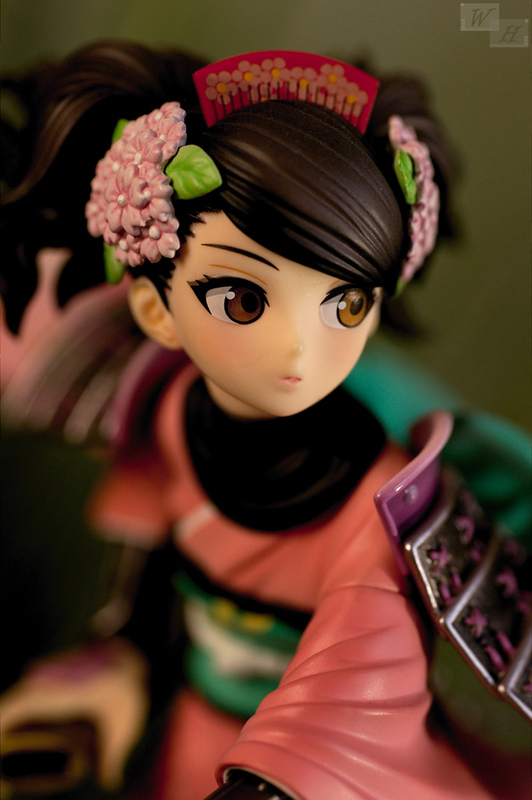 I would say Momohime is one of my prettiest figures, her head has a nice shape with a sweet face and very expressive eyes. 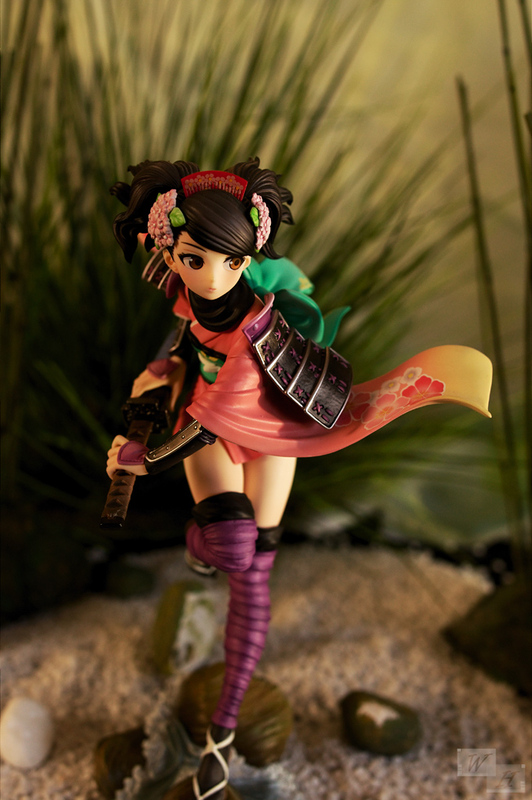 This figure convinces in her traditional japanese appearance, her colorful Yokata looks beautfiul. These armor on her give her this light martial touch, I really like the contrast between the petite, pretty girl and rough armor parts. The idea behind this shooting was to create something like a Japanese bamboo forest with Momohime walking through a dried out riverbed. The previous indoor shots had a quite artificial look with weird white balance and so this time I aimed to get something more natural. I already had a few things at home like the little white stones and the pebbles. I only bought the grass and the two foam blocks at an arts and crafts shop. The foam blocks were cut in shape, after that they were wrapped with glue and paper and painted in earth and swampy colors. 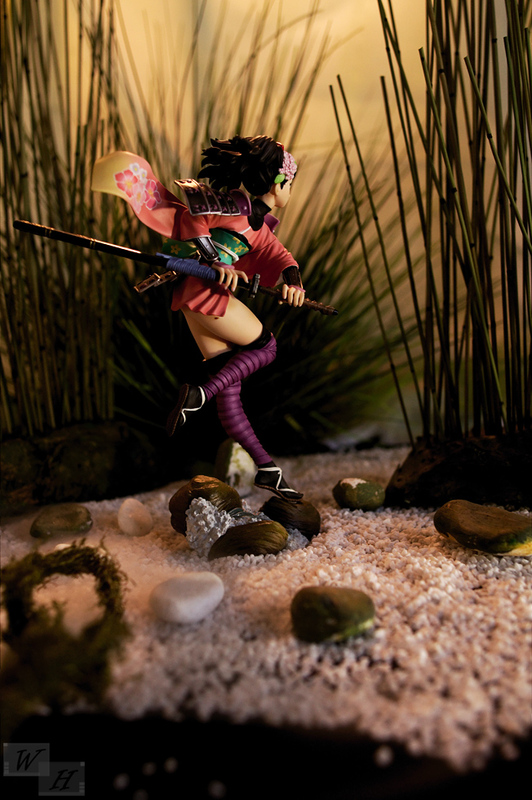 A few pebbles received the same paintjob treatment to match the base of Momohime. After everything dried properly, the foam blocks were ready for step 2, the previously cutted grass was pushed in the foam blocks in a tight pattern. Then I placed everything where I wanted it to be and pinned white and transparent green fabric at the wall behind. Comparing the new pictures with the old ones is a bit unfair from technical point of view, I guess I even had no flash at that time. For a little fill light I used my trustworthy 60×40 Walimex softbox, for some spotlight I used a bright led bulp. My two wireless flashes were placed randomly, it’s still some kind of gamble for me how the flashes will work in the pictures, even though the new one has a manual mode, one of the flashes was placed high above from behind. 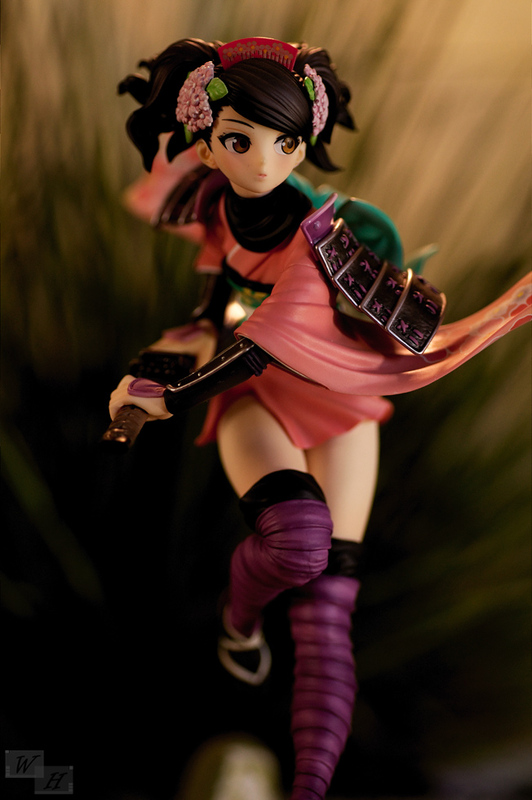 After weeks of thinking about an idea for a better shooting or better said setting, I finally gathered all needed parts and motivation to get started to let Momohime shine again. Im quite satisfied with the outcome of my reshoot, it was fitiing surrounding and the light setting helped a lot with creating the desired more natural look in terms of lighting and colors. What not worked in this setup was the fog effect, the little fog machine had no sufficent output to create the desired effect in the rather bright setting, when I think about it, I could have flooded the “riverbed” with water, but water in a room is no good idea and I have no idea how to clean up such a mess. Maybe I will try this in another shooting. 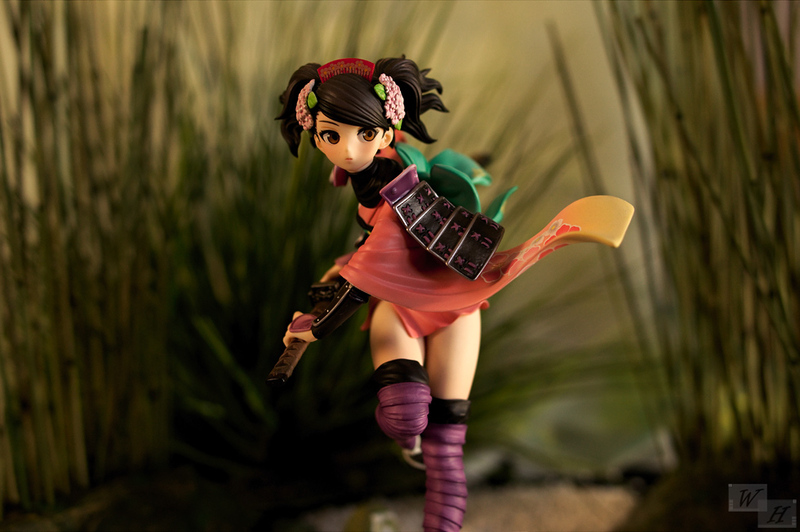 Momohime! One of my fav figures and only one with Natsume figure I have from ALTER. Fantastic quality, dynamic posture, beautiful details, eye-catching color combination! She’s like a tropical butterfly – bright, elegant and light! I like the background you used, it suits her a lot. 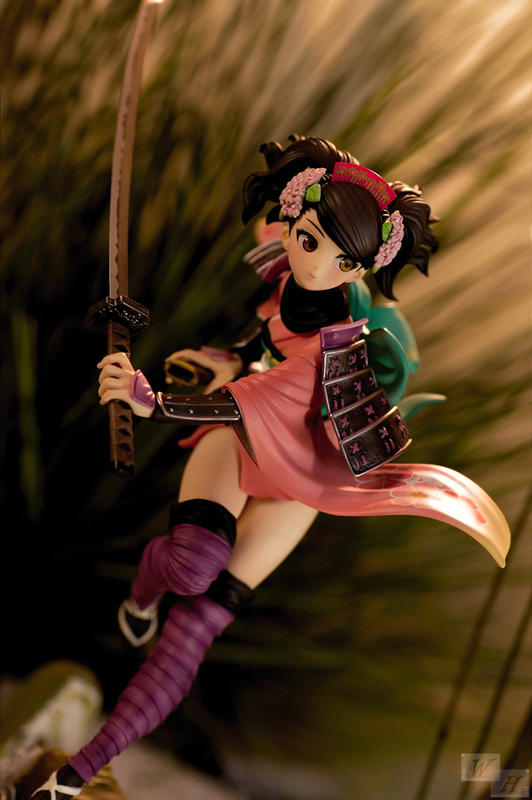 I see Momohime is also among my Alter favorites, I love the videogame look of her which is a bit more detailed than figures which are based on anime characters. I love her colors and proportions as well. Thank you Im glad to hear that, since it was the goal of my reshooting. 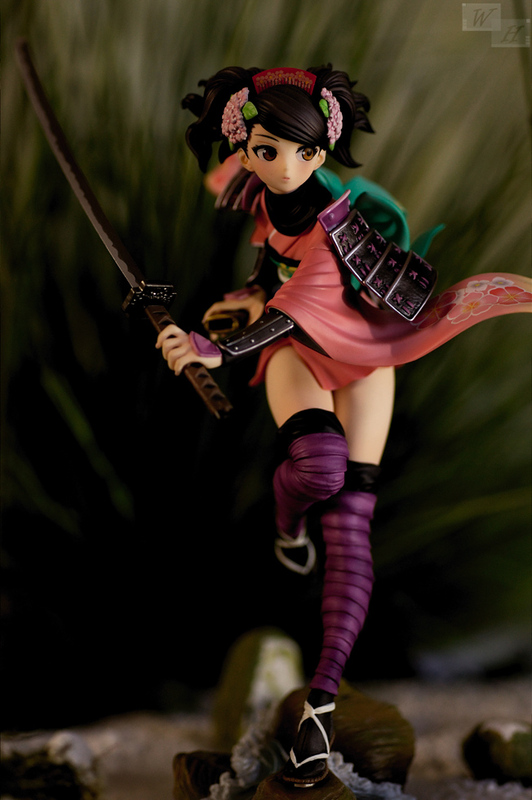 Momohime is gorgeous. I bought her with a credit card back when I was unemployed years ago. No way I was letting that one go. 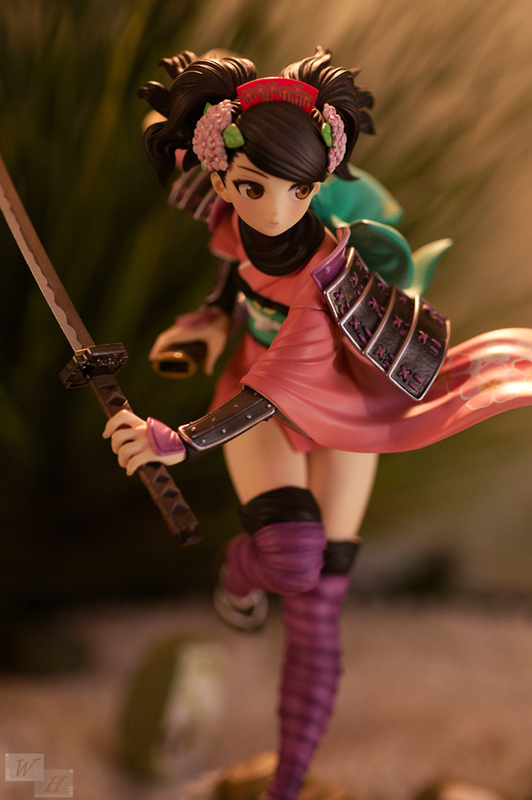 As soon as I saw Momohime, I wished for a figure of her and BOY did Alter deliver! Her colors are so beautiful. And by “like” in that first sentence, I mean “lack”. D’oh! Ah lack you meant. Well, you can also get cheaper ways for creating good lighting and used dslrs are actually affordable. Thank you very much, it’s fun for me so I don’t mind to invest more time in creating a more or less elaborate setup. Your pictures are good, maybe you hould experiment a bit with different backgrounds. 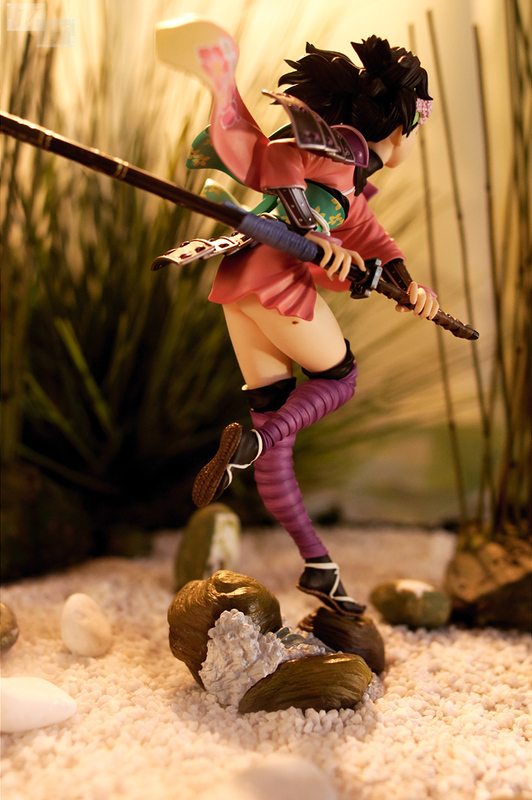 Momo is a fantastic figure, I love her face and the hair, the outfit of course is another highlight. I can certainly see the difference checking out your old Momohime post. The colors are too dark and burned, no contrast, and the white balance certainly doesn’t feel natural. 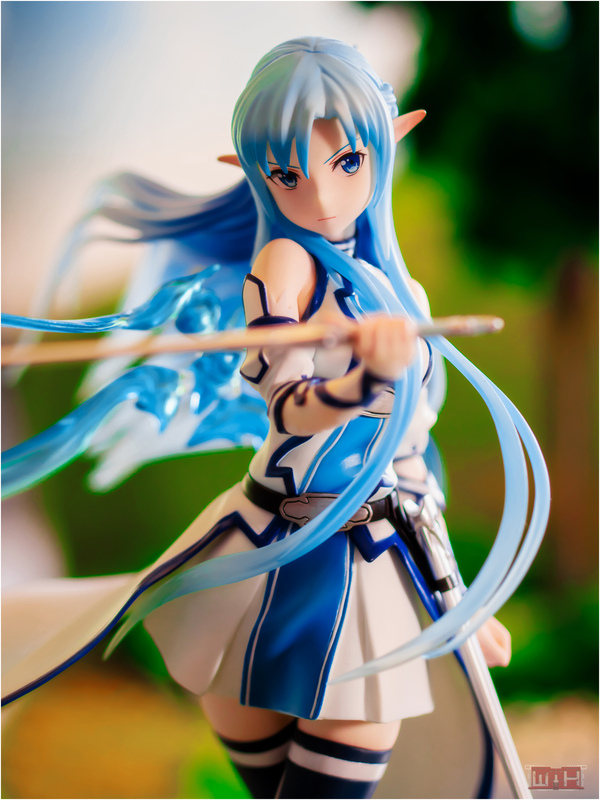 Did you specifically and literally create settings like that for all the figures you take photos of? Can’t say I’m that dedicated myself ;p As I just use my room as a background, lol. I know some people also prefers to just use a fixed color backdrop. *Wuahh* don’t be too hard on my previous work, Kai XD Well, it is good that you see a difference. but I also reuse things, like stones, cloth or modify things that I’ve built. Well, these are also ways to make figure reviews, but I prefer it my way. Just being abnormally critical xD Your old photos are still better then my “lazy” photos, lol. What prompted you your idea of this reshoot? Is it the color of the figure or the style or something else? I’m actually clueless about photography. Not sure what’s the white balance and technical stuff like that. However, I love seeing pretty pictures, lol. By the way, what camera are you using? I sometimes make some blogbmaintenance and look at old posts. 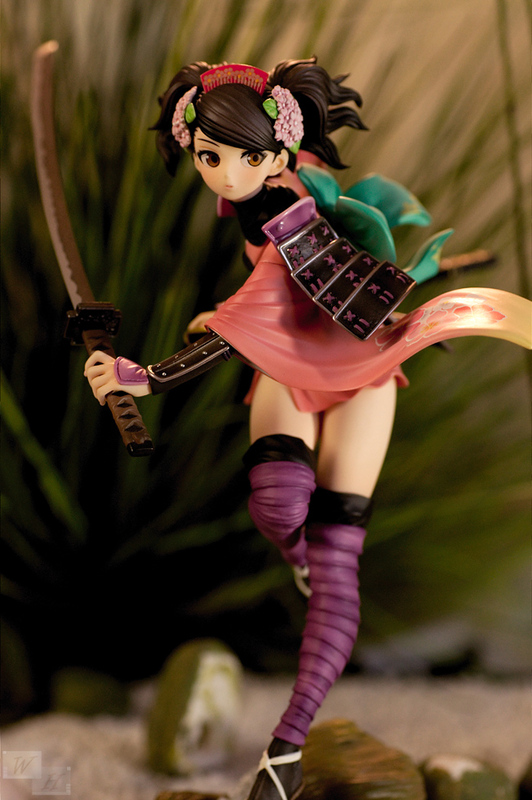 As I looked through Momohimes post recently, I was a bit dissapointed with the old pictures. I took up the challenge to come up with something better than before, she’s a very pretty figure that deserved something better. You can change that ^^ thank you. 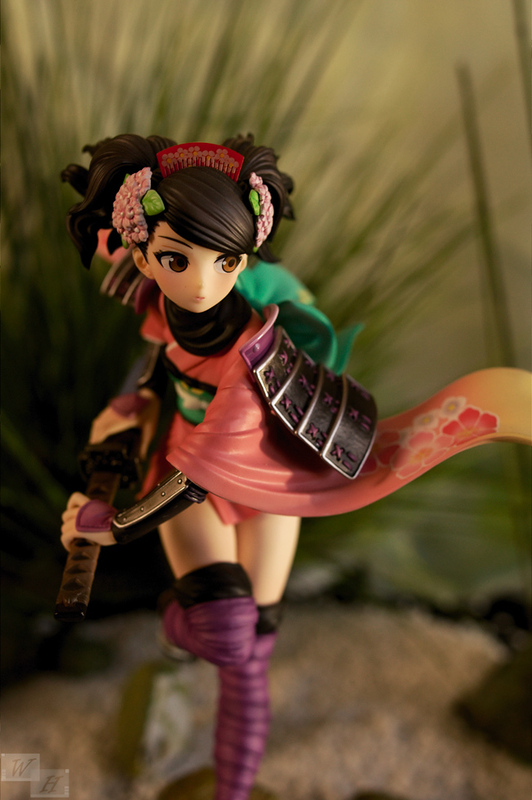 Pfft… here you are doing a second photo shoot for Momohime and I have yet to unbox my own, going on four years now. 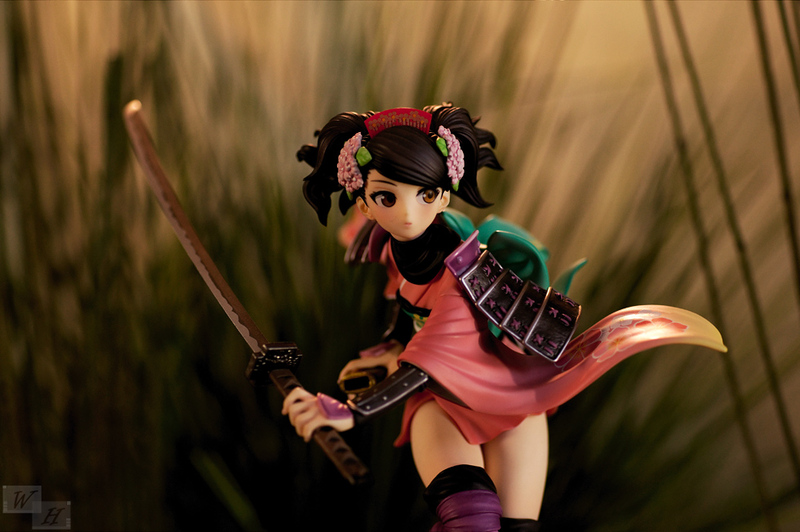 Someday I will take pictures of my Momohime, doesn’t help that I feel like just saving her for the one time I have her and my DSLR with me when I travel. I have found several times spectacularly fitting waterfalls for her and in an appropriate scale no less. Oh man, I’m glad I inspired you, one of the things I love about my fellow figure bloggers is the inspiration that comes from looking at one another’s pictures. So true, looking back at my stuff I feel like killing myself… so darn embarrassing. While I could simply remove it I leave with the purpose of showing people that anyone can do it and you can always improve all it takes is practice and a little creativity. Yes, I did and I never leave my figures in the box for long when they arrive. H you already found a few places, then just give it a little more thougt until you came to a fitting idea. Yes you can always improve and actually it can be interesting to look at the things you did earlier. In worst case take the figure and make better pictures is a good solution. Also I am a figure I am collecting it. Until I am troubled in the place, I am. You can also write in Japanese. figure collecting is fun, isn’t it? Yes, space can be a problem sometimes. Ah I see. Well, she was also sold out pretty fast. You had only limited time to get your order trough, anyway. She’s a great ALTER figure for sure, maybe one of their best.